Great news, football is back! Horray! Sod enduring England’s tropical heat wave, it’s time to plonk yourself down in front of the TV to revel in goals galore with your old mates on Soccer Saturday. With the Football League back in full swing, and the Premiership less than two weeks away from kick off, what better to get you in the mood for a season of heartbreak and jubilation than a selection of great footballing films? Goal machine, philosopher, lunatic, Manchester United legend and all round eccentric Frenchman- Eric Cantona is one of the beautiful game’s most memorable members and he knows it- “I am not a man… I am Cantona”. While the footballing icon takes centre stage the film is less to do with the sport but more a humorous look at the power of hero worship. Catona puts his boots away for Looking For Eric, instead he takes up the role as spiritual guide to avid Manchester United fan and postman Eric Bishop (Steve Evets) who’s enduring something of a midlife crisis. Bishop’s troubles with his rebelling stepson and ex-wife leave him on the brink of suicide, that is until he smokes some cannabis only to hallucinate his hero Eric Cantona who attempts to get Bishop’s life back on track. It’s an endearing little film from veteran director Ken Loach, the chemistry between the leading Erics is wonderfully daft yet always intriguing such is the eccentric nature of King Cantona. A modern day Harvey, only with a hulking beardy Frenchman not a rabbit, it’s a fresh take on the football film that does an excellent job of parodying Cantona’s philosophical nature and utilising his cult status to make the film a memorable 90 minutes. Eric Cantona would probably describe Looking For Eric with his favourite metaphor: “When the seagulls follow the trawler, it is because they think sardines will be thrown into the sea”. Brilliant. 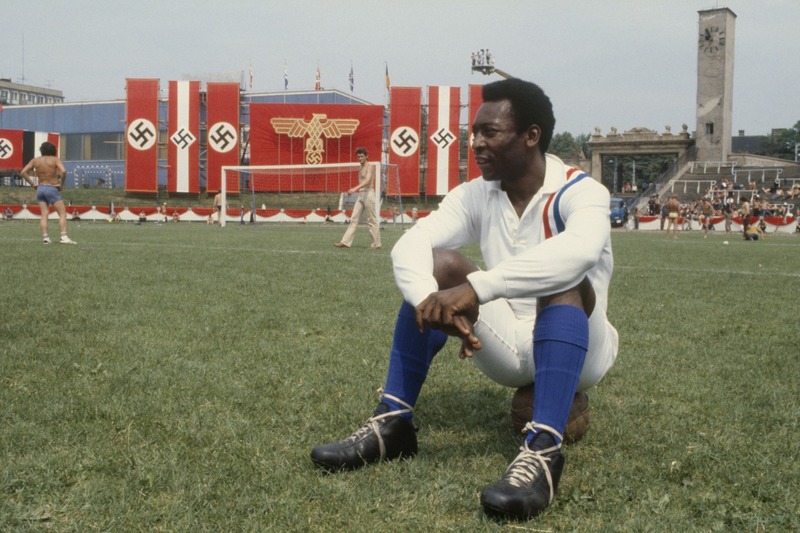 More surreal than any football related dream, Escape to Victory is so incredibly ridiculous in regards to its plot and cast that it somehow works. Escape to Victory can lay claim to having one of cinema’s best ever casts with the likes of Hollywood stars Michael Caine and Sylvester Stallone side by side with footballing greats Bobby Moore, Pele, Ossie Ardiles and…erm…most of Ipswich Town’s squad. With a perfect ensemble of acting talent ready there can be only one setting for them- a prisoner of war camp in Nazi Germany of course. A weirder, stupider and all together more hilarious version of The Great Escape, the John Huston directed picture pits a POW football team against the might of their Nazi captors in a match to show the Aryan sporting supremacy. The film has dated quite terribly leaving some unintentionally amusing moments, one of the best being Major Karl Von Steiner doing some kick ups with some legs that clearly aren’t his. The film is worrying amateurish, further unaided by some wooden acting- Pele may have scored 1000 goals but he couldn’t act his way out of the six yard box. Despite being a completely unbelievable it’s a remarkably great film with its faults more charming than detrimental. The final match is excellently done, choreographed effectively to balance the tension with some actual game footage, something notoriously hard to make look half decent in films. So bad its great would is the best way to describe Escape to Victory, the fact it’s the only place to see Pele in the same team as Rambo is enough to make it compulsive viewing. 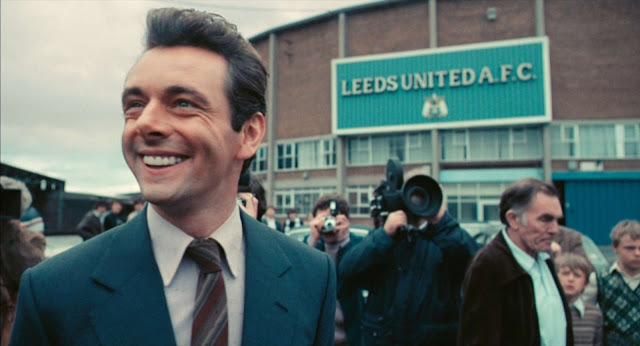 A majority of football films are frankly rubbish meaning it takes very little to make something of any discerning quality in the genre but The Damned United makes the list on merit of its all-round brilliance. Based on David Peace’s acclaimed and controversial novel it follows outspoken manager Brian Clough’s early career, paying close attention to his torrid time in the 70s at Leeds United, a club he openly bashed prior to joining. Michael Sheen gives an accomplished performance as the enigmatic manager, perfectly portraying why he was so loved and hated in equal measures. Director Tom Hooper (Les Mis & The King’s Speech) understands where football films weakness are and avoids these mistakes, notably The Damned United features very little actual football being played considering the game lies at the heart of the plot. Rather than detracting it lets the focus sit firmly on Clough’s shoulders letting the drama unfold without any underwhelming game footage to deter from the story. The acting is absorbing throughout, successfully balancing the larger than life personalities with convincing emotional conviction, likely as a result of some choice embellishing to aid the entertainment value. Stephen Graham as Billy Bremner is a stellar choice for the role, injecting the Leeds captain with the thuggish little man syndrome he’s made a career out of, Graham is just one example of the dead-on casting. The Damned United recreates the romance of the sporting underdog in an uncontrived fashion- the plot is contextually ample without dragging on, led by the always engrossing Michael Sheen it’s no exaggeration to call it the best film about football. It’s impossible to discuss football on film without reaching the well documented topic of hooliganism- the most derisory part of the game but also one of the most fascinating aspects, the tribalism often romanced beyond its primitive thuggery. 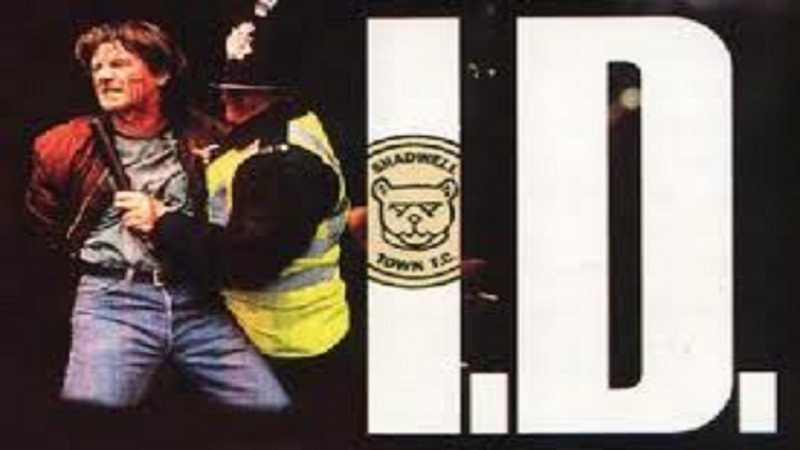 Countless trashy hooligan flicks have been produced with almost all being laughably bad and include Danny Dyer, the two go hand in hand, but relatively forgotten made for TV film I.D. is a top draw effort. Featuring a cast instantly recognisable from their time in TV Soap world it’s a great dramatization of the true story of a young police officer’s undercover mission into joining a football ‘firm’ for fictional club Shadwell Town in order to root out the ringleaders and stop the violence on the terraces. The danger, as it always tends to be with undercover work, is that the protagonist, John (Reece Dinsdale), loses sight of his work and falls prey to the seedy allure of fighting and boozing at the football. Unglamorous and hard hitting without the use of excessive violence or ‘mockney cockneys’ the BBC produced film is an engrossing character study with Dinsdale’s sadistic transformation from nervy newbie to hardened hooligan every bit plausible. Avoiding the fallacy that all hooligans are Eastender’s extras with one track minds I.D. gives John a well-rounded character that teases more than mindless violence. It’s by no means perfect with some accidentally laughable moments but it’s the best football hooligan film out and ultimately very entertaining from start to finish. Ignore the embarrassingly bad Green Street and stick to I.D. for you healthy dose of ratchet and spanner brawling. Looking at football from an outsider’s perspective really makes you see that it’s all a bit silly really- laughable in how incredibly serious it’s all taken, never more true than when it comes to the Three Lions donning their white strip for the World Cup (when we qualify). 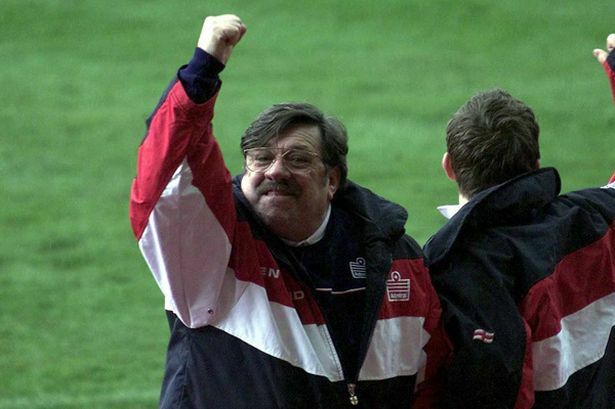 Mike Bassett: England Manager takes the nation’s obsessive love/hate relationship with the national team and forges a comedy of errors out of it. Taking the piss out England’s appalling performances, the damning media pressure and all the idiotic, extremely familiar, characters that make up the team it’s a hilarious satirical take on the England set up. Shot as a mockumentary that shadows new England manager Mike Bassett (Ricky Tomlinson) who is under qualified, out of touch and, for want of a better word, an idiot. Starting with his surprise appointment all the way to the World Cup Finals it’s a must see comedy for football fans- constantly shifting the humour from a Mutley-esq snigger to full on fits of uncontrollable laughter. Tomlinson puts in an expectedly excellent shift for a man of his comic pedigree, managing England to almost certain disaster. Cameos by Pele only heighten the film’s credibility as he constantly writes off England’s chances, failing to notice they even qualified. Digs at the shadowy FA and Mark Lawrenson are thrown in for the ardent football fans but there are a broad enough range of laughs for everyone. A quotable masterpiece, Mike Bassett is the sporting equivalent to Spinal Tap and required viewing for next year’s World Cup…if we qualify. Making the list for purely artistic reasons, Zidane: A 21st Century Portrait is actually the height of tedium, although it does get top marks for creativity in the congested football genre midfield. The film simply follows iconic French World Cup winner and serial headbutter Zinedine Zidane round the pitch in a game for Real Madrid in 2005, using 17 separate cameras the action never leaves Zidane whether he has the ball or not. Filming him for the entire 90 minutes with no room for variability means that most of the footage is rather dull as the balding midfielder hunts the pitch in search of the ball. With no context for the rest of the game the film highlights the loneliness of Zindane, moreover how little a player, even of his calibre, actually touches the ball in a game. A bold orchestral soundtrack from Mogawi accompanies the shadowing, adding gravitas to his every move, pass or shot. An interesting concept and vision that gets to the heart of one man’s universal brilliance with ball but tiresome for a whole game. It’s worth watching the highlights but too long to bear for the full 90 despite its innovative look at the beautiful game. Gazza’s tears, Southgate’s missed penalty, Pavarotti’s rousing rendition of Nessun Dorma- England’s 1990 World Cup campaign had it all, most of all it was bloody emotional. One Night in Turin is the epic documentary of England’s trip to Italy for the World Cup, a tournament that saw England written off from the start on the pitch and marred by hooliganism off the pitch. Primarily focused on the game yet the film is much more than that, it’s a journey for England as a nation from its dark days in the 1980s to a new wave of optimism born out of the team’s performance at Italia 1990. It’s a relatively straight forward documentary, delving into the troubled build up, the tournament itself and the lasting results. It’s insightful contextually, the hooligans on tour making for an exciting sub plot, while the footage of games is built up with authentic tension worthy of a live viewing, an even more impressive feat when you consider England’s games were low scoring with little action bar a couple of stunning goals, Platt’s volley the best of the lot. The joys of seeing a youthful Paul Gascoigne mucking about in training along with New Order’s catchy anthem World in Motion make One Night in Turin a joyous ride of nostalgia, but it’s the stirring climax that makes it all worth it. The heartbreak against Germany is even more emotional than when it happened live….probably, I wasn’t yet born. I dare any proud Englishman not to be blubbering in their retro Umbro kit like Gazza come the documentary’s end. Finally one for the girls who despise football and how it steals the men in their life away from them for 9 months a year. Religion, culture, romance, gender stereotypes and sexuality; Gurinder Chadha tackles a lot of issues in this comedy-drama. 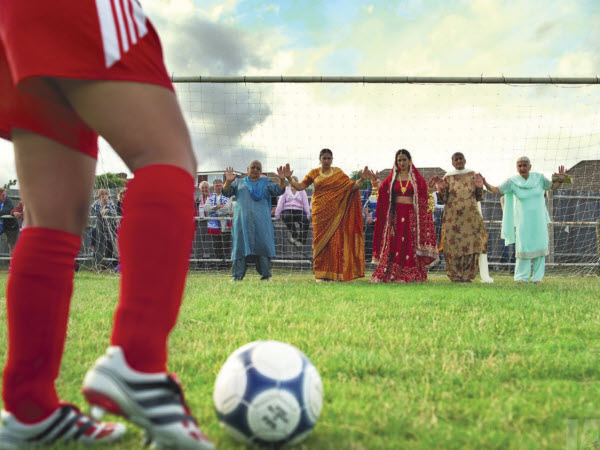 The film focuses on Jess, played by Parminder Nagra (better known as Dr. Neela in ER), a young Indian girl living with her culturally strict family, who disapprove of her passion: football. After being spotted by Jules (a fresh faced Keira Knightly) Jess gains a best friend and a women’s football team to play for. Coached by Joe (Jonathan Rhys Meyers) the team train and travel together as the girls take on the other problems that come with playing a predominantly male sport. Jess’ parents want her to find an Indian boyfriend like her older sister and learn to cook a chapatti, while Jules’ Mum believes that they are in fact lesbians. Chadha shows true knowledge of Indian culture in Britain, enough to make this film truly funny and still show respect for religion and tradition, leading many people to believe that the film’s title refers not just to football but also to bending the rules of society. The film shows how Britain is changing and the discrimination that some communities face but is brought to an end with a scene of Jess’ father and Joe playing cricket, uniting the two cultures… straying slightly from the football theme but who’s counting? Pingback: 12 focis film, amit még a foci EB előtt látnod kell | Filmezzünk!